Yay, it's finished thanks to Floribunda who sent me some black yarn so that I could knit those last rows. I love it! It's that perfect mix of goofiness which is sometimes me, lots of green - one of my favorite colors to wear, and it's warm! Just in time for racing season which starts now. EDIT: Oops, I totally forgot to mention that this is Saartje's Noro hat pattern but I didn't use Noro yarn. I've been working on the knit hat in the evenings. If my wrists hurt then I put it down. Some evenings they didn't hurt and as you can see, I got a lot of rows done. However, do you see that little stub of yarn poking out to the left? That's it, that's all that I have left of the two skeins. Am I finished? No! I still have this row and two more to do before it's officially done. I'm short by less than a yard probably. Yikes! So I'm trying to figure out what I should do. I really don't want to buy another skein because I'm not sure what I'll do with the rest. I'm wondering if I should just use a little bit of the blue Aran wool that I have from Ireland and not worry about it matching the greens. It may look interesting. What do you think? How do you like my solution for a row marker? It's starting to look like a hat! After just two weekends of knitting in between races it's finally starting to look like a hat! Yay! I'm also getting close to the end of this skein. It's on circular knitting needles that are 16" long. What do I do when the pattern starts decreasing? Do I just constantly shove the stitches closer and closer together? Or will I have to transfer to double point needles at some point? Any ideas? Here's a closeup of the knit and purl rows. So far I like it a lot. Do you notice what I'm using as a stitch marker? It's an extra ring from a key chain. We spent this past weekend at a SCCA double nationals race held at the Phoenix International Raceway. The weather was sunny and warm, okay, hot. Fortunately my aunt and uncle (who live only 45 minutes away) were able to meet us for dinner. And they brought two guests -- my grandma and grandpa who were out visiting them. Yay! We haven't seen them since last year so it was a real treat to visit with them. They even had time to come out to the track and watch Steve race on Sunday. Here's my grandma Panetta. Can you believe that she's going to be 80 in a few weeks? It's amazing to me since she is such a young-at-heart person. I truly hope that I'll be blessed with that when I'm her age. And here's my grandpa Panetta. He'll be 85 in a few weeks as well. They still drive around the country in their motorhome year-round. Occasionally they'll stay with various family. This past year they stayed "parked" for a large portion of the year due to the cost of gas. I was soooooo excited to have seen them. Steve was thrilled to race at a Nascar track ... but they didn't do the oval. They created a road course instead. In addition to assisting Steve with the race car I began a new portable craft project: a knitted hat! This will be the second item that I've knit so I can't wait to see how it turns out. 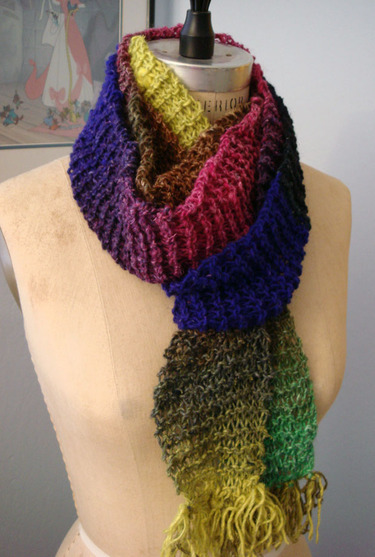 Here's the pattern that I'm knitting, but I'm not using Noro yarn. I wanted something much softer. After it's done I may try it again in the Noro Kureyon. So far I can say that I have developed a comfortable rhythm for knitting but not so much when purling. I guess that it'll just take more practice. May I present to you, my first official finished knitted object, the one, the only -- Noro Silk Garden Scarf! Yay! This was finally completed the other night and I can't fully describe how many ways I'm pleased. First, this was the result of teaching myself to knit. I used books ("The Good Housekeeping Illustrated Book of Needlecrafts" by Cecelia K. Toth) and websites (learntoknit by lionbrand and knittinghelp) as my knit gurus. I used the uber simple garter stitch and since then I've become familiar with purl, 2x2 rib, stockinette, and the slip stitch. So now I am formally adding knitting to my list of artistic interests. Second, I'm happy to have found something that I can do in the evenings while enjoying my husband's company. It's not too fun to sew in the other room when he's home after work. I'll keep that as a day endeavor, unless it's a sewing emergency. You know what I mean -- when the gift is due the very next day and you're only a third of the way to completion -- not that I plan on doing that anymore, oh no sirree, not me. As a result of my newfound interest, I chose the following book to read -- "Chicks with Sticks (It's a Purl Thing)" by Elizabeth Lenhard -- as this week's reading. I didn't realize that it was about teenage girls, but that's okay. No matter how old I get, there's still the odd teenage moment of awkwardness. Thank goodness it's not often, but it does make such a book interesting. I'll let you know what I think after I've finished. And the next knitting project is a Mason-Dixon washrag. I know, it's a simple project, but it's so cute. After that I'll have to get a good pattern for a man's watchcap to make for Steve. My dad calls them felony caps because it's what you always see the tv show felons wearing. So if anyone has any good suggestions for one, please give me a holler. Look at what I accomplished last night! I couldn't find my book with how-to-knit instructions so I searched the net for info. I found this site with great pictures that made it fairly easy. Of course I had to start, then stop, then repeat a few times before I felt confidant enough to continue. I started with 12 stitches and somewhere along the way it turned into 13. I'm thinking that I forgot to slip off one of the old stitches. Oh well, once I noticed the problem I just treated 2 stitches as 1 and now it's back to the original 12 count. :-) And I discovered yesterday that this is the month of Norovember with lots of great pictures at Flickr. 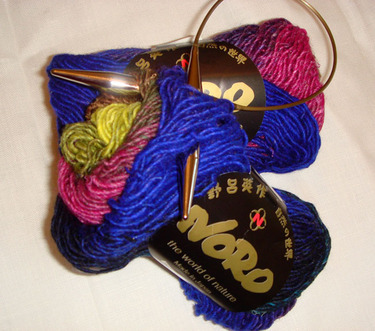 What a fortunate coincidence that I chose a Noro yarn to start knitting! This is going to work out well. I was able to do something crafty yet still keep the hubby company in the living room. I'll save the sewing projects for daytime. Today's agenda is to make the Wee Bunny for young master B (one of the nine remaining on the list). 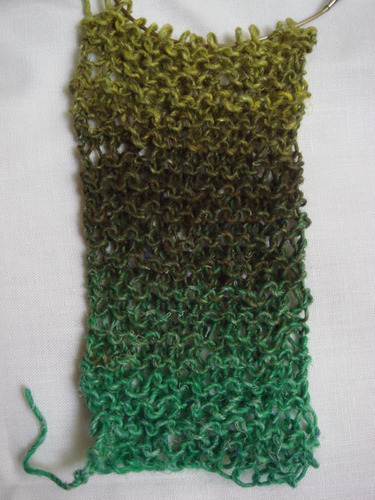 My first project will be a simple scarf ... all knit, no purl, just to keep it simple. The thing that I really, truly want to make -- the thing that just makes my heart sing when I look at it -- is the gorgeous Lizard Ridge Afghan shown in the Fall 2006 issue of knitty (designed by Laura Aylor). There's even a Lizard Ridge Knitalong and here too ... wow! Okay, I'm smart enough to realize that I just can't possibly try something like that until I've practiced for a while. But I'm just dying to get better so that I can try it too. Don't you just love the colors? See, there's my love of bold and vibrant color combos again.